Located in central Melbourne on a corner laneway behind the busy shopping streets. 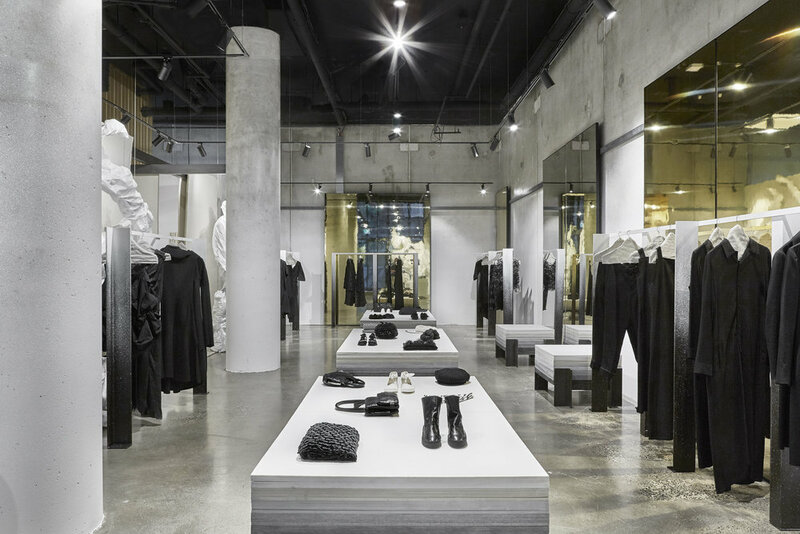 It has been designed as an intimate, tactile & calming retreat for shoppers to experience beautiful garment design in a space blurring the edges between object, furniture & interior. A crumpled white translucent skin lines the interior filtering light and views through the glass. Softening the space & providing backdrop to the predominantly dark coloured clothing. Garments are displayed on slender steel rails floating on angled steel-dissolving vertically to white. Arranged along the ombre white & concrete walls so as to make the space feel expansive and inviting. Sliding gold panels animate the interior, reflecting views of the garments & crumpled paper screen. Tucked away to the the rear, the fitting rooms are enclosed with raw felt and woven sisal flooring. Moveable plinths arranged centrally, made from layered felt provide display for shoes & accessories. Seating is formed from raw steel sections sandwiching layered textured panels blending from dark to light, dissolving between floor and object.